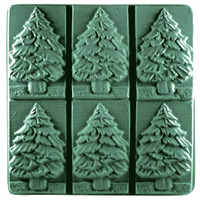 Create a wintery landscape with this tree mold or turn it into a Christmas tree with some mini circle column embeds. 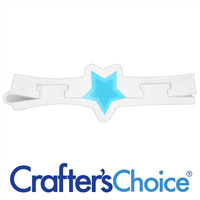 Use the mini star column to add the finishing touch on top! Embed fits in Crafter’s Choice Regular Loaf Silicone Mold 1501 and Rectangle Regular Column Silicone Soap Mold 2009. Bar Length: 2.25" Bar Width: 1.75"
COMMENTS: Really enjoyed making Tree embeds for X-mas. Fit the 8" long molds perfectly. Easy to snap the 2 halves together and they make a pretty decent seal, though some trimming/clean up was necessary for a clean embed. 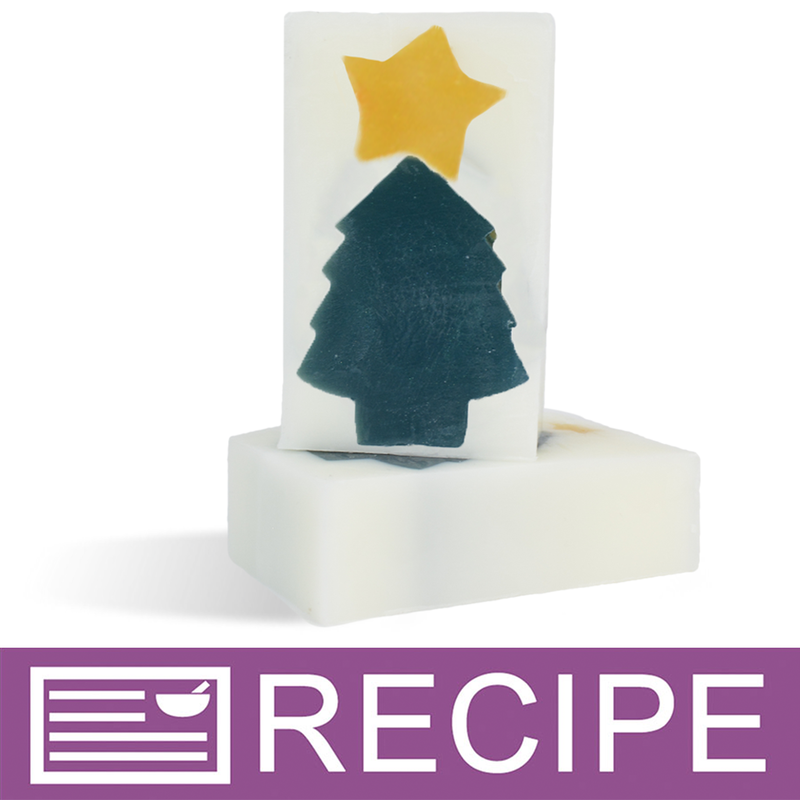 "Tree column mold pair with a pine scent!" COMMENTS: I pair the tree column with your Santa's Christmas tree scent. It's a big seller around xmas! Best of all no leaks! "Nice large size column mold"
COMMENTS: Love this mold. 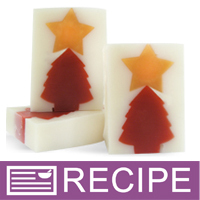 You can slice for individual soaps, or use as embeds in bars. COMMENTS: It's a nice shape & it worked well. I have many plans for the soap I'll make with it in the near future!! COMMENTS: I love this cute little mold! It's easy to put together and makes the perfect size trees for embeds. I'm already excited for holiday soaping! COMMENTS: I was looking for a soap mold that I could use for guest soaps. I have a B&B of guest cabins in the woods, and was looking for a signature soap. Am happy with the mold, but I know to use binder clips on both sides to hold it shut or it will blow open when you pour in the soap. Am very happy with the finished shape of the soaps, though the mold does bow in towards the top where the "tree" gets thinner. You don't really see the bowed part once you cut the soaps. Cute mold, easy to use, easy to clean up. COMMENTS: Sturdy, it did leak first time I used it. You must be sure to get it sealed on all sides and that was a bit difficult, but once it sealed it worked well. COMMENTS: I was very happy to find out that these are bigger than a typical mini. They are great for embeds and you could also cut them for guest soaps. Would love to see if they get a larger variety of these. COMMENTS: This is a very sturdy mold and very easy to use. The Christmas trees come out so cute and are a perfect size. "Good for Christmas or a woodsy smell soap"
COMMENTS: This is an incredible mold! It is so easy to use, no leaking, no forcing the soap through a tube. I have always shied away from doing loaf soaps with embeds because typically the tube molds are difficult, tippy and leaky. Not so with this one. Seals great, stands on its own, easy to unmold. On top of that, it fits perfectly in the WSP standard loaf mold, so no need to balance it, just pour the first layer, put the tree in and when set, pour the rest of the soap. I am definitely going to try the other silicone column molds like this one. "Can you use these with cold process soap? If so, will they release clean?" Hi! My cold-process recipe makes a hard bar. I tried it with this mold, and even forced gel in the oven. Next day, the soap lifted right out. I was concerned that the little tips of the tree might not release, but they were fine. I think it's important to be patient and release this mold only when soap is ready; if I use a softer recipe, I'll probably pop the mold in the freezer before I unmold. These column molds are the best it seems like anything silicon seems to release cleanly. I love these molds they might need a few extra days to cure to harden depending on your recipe. "How many pounds or ounces of soap does this mold hold?" Staff Answer This mold holds approximately 15 oz. of soap.